Make your own personalised jigsaw. Photo puzzles made to order. To turn your photo in to personalised jigsaw, select puzzle type! Top quality personalised jigsaws are printed with ECO friendly printer and glued to a robust, specially made puzzle card. We cut the cardboard in to puzzle pieces with custom made cutting die, to ensure that the pieces are crisp with clean cut. By having all the necessary tools to make the personalised puzzle ourselves and a partnership with UPS and DHL, we can ensure that you will receive your jigsaw photo puzzle as soon as possible. You can choose either express or standard delivery. With our built-in online photo editor, you can re-size, crop, drag your photo any way you want, you can even add text onto your uploaded photo. By using our online photo editor, you will be able to see a clear preview how your picture puzzle will be. Get your personalised jigsaw puzzle now at PuzzlesPrint! 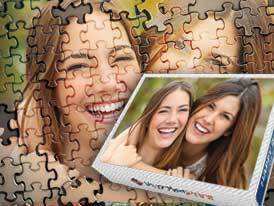 With PuzzlesPrint you can turn your picture into a personalised jigsaw. Photo puzzles make great personalised gifts for any special occasion that is important to you! Personalised puzzles, magnetic puzzles, photo collage puzzles, frame jigsaw puzzles, promotional puzzles, wooden jigsaw puzzles and plastic jigsaw puzzles are delivered throughout the UK. Express or standard delivery options are available. Our custom made jigsaw puzzles will make very convenient gifts. A personalised puzzle is great for any special occasion including birthdays, Valentine’s, Christmas, retirement and the like! Your friends, colleagues, relatives will surely appreciate the great custom made gift that our photo puzzle is. Magnetic puzzle is also a very interesting alternative to a standard personalised jigsaw or get a photo collage puzzle created with multiple photos of your own. After having solved the puzzle, you can turn it into a lovely picture by sealing it and putting a frame around it. Our jigsaw puzzles are different in the fact that they feature a photo which is selected by you, instead of a boring stock photo that you will find on any jigsaw puzzle sold at your local store. If you like doing puzzles, you will love our custom made jigsaw puzzles, you will enjoy putting together a picture that is chosen by you much rather than any stock photo. 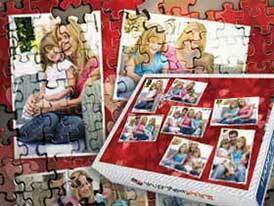 If you wish to make something special, why not go with our photo collage puzzles? Simply pick a template, upload photos of your choice, select jigsaw size and we will create a photo collage jigsaw puzzle specially for you! 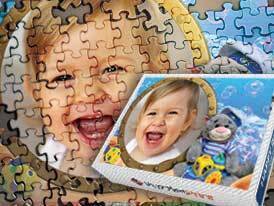 Or check out our photo frame jigsaw puzzles, we offer various photo frames that will beautifully compliment your photo. They are available in 8 different puzzle sizes, we are sure you will find a photo frame that suits your photo the best. Photo frame puzzles make great gifts for birthdays, weddings, valentine’s day or any other special occasion! 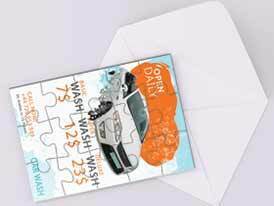 Our personalised jigsaw puzzles are fantastic for promotion, or having a creative invitation or greeting card. 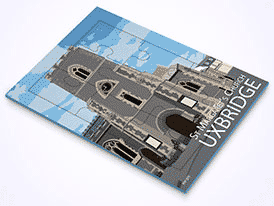 Have a look at our promotional jigsaw puzzle category and see how your business materials and wedding or birthday invitations could stand out. 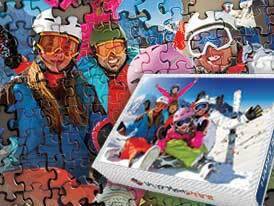 Promotional jigsaws can be made with or without magnetic surface. Fancy a different personalised jigsaw? Check out our wooden jigsaw puzzles. They are available in 2 different sizes and with 6 different piece counts. Three of our personalised wooden jigsaw puzzles have message cut out of the pieces – I love you, Happy Birthday and Merry Christmas. Personalised wooden photo jigsaw puzzles will be a great gift. As the wooden jigsaw puzzles are made out of wood, it gives that premium touch to your custom made wooden jigsaw puzzle. 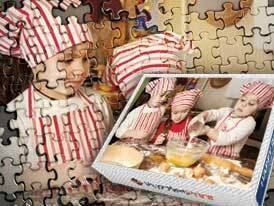 Looking for durable puzzles that kids can play with, or you need to promote your business in the upcoming fair and many people will be putting the puzzle pieces together? 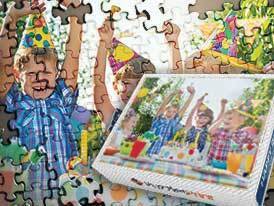 We have a solution for you – personalised plastic jigsaw puzzles. They are basically the same as our standard cardboard jigsaw puzzles, except they are made out of plastic. 6 different puzzle piece counts available for plastic jigsaw puzzles.